It seems like a very simple question: after all, you just read up on a deal online and then summarize what you find, right? Right? Sure, background research must be part of your answer to this question, but it’s not just about summarizing the news. The real point of this question is to test whether or not you speak the same language as bankers, and whether or not you can extract the 80/20 of what’s relevant about transactions. But can you walk the walk when it comes to speaking the Banker Dialect of the English language? If you can, you position yourself well for internship and full-time offers. And if you can’t, you might want to start thinking about your “Plan B” options. 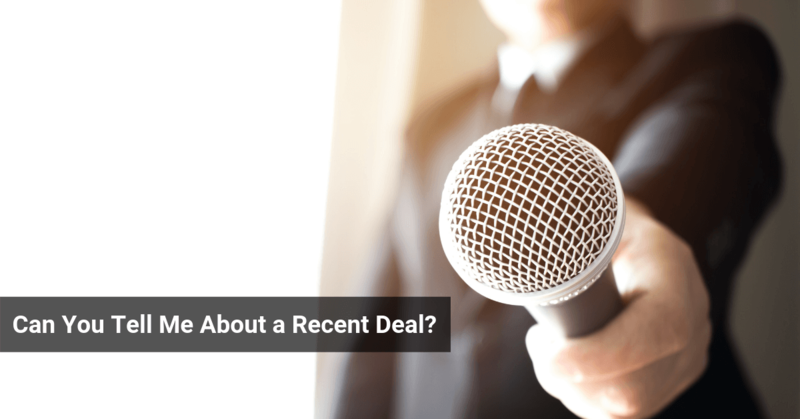 Asking you to discuss a recent deal is an easy way to test whether or not you really understand how deals work (whether it’s M&A, debt, or equity / IPOs). You can BS your way through “fit” questions and you can memorize responses to technical questions, but it’s much harder to do this for deal discussions and still sound reasonably intelligent. It’s the same reason why case studies are so widely used in the EMEA region, and are now common even in the US, especially for lateral interviews: if you can’t walk the walk, it will be very obvious. In regions with assessment centers and competency questions, such as EMEA and parts of Asia-Pacific, deal discussions are likely to come up in the form of written questions or case studies given at the assessment center. Picking a deal to research in the first place isn’t terribly complicated: focus on bigger transactions that have decent coverage in mainstream sources, and just do a search for recent deals in an industry you’re interested in. A long time ago, you could get information on deals more easily because the WSJ used to publish “deal profiles” in its Money Beat blog (example for Oracle and Acme). Unfortunately, they no longer publish these detailed profiles, so you have to do more detective work. Read mainstream press releases from the usual sources – the WSJ and FT, Forbes, Business Insider, etc. You can get a lot of the qualitative information from these. The NY Times Deal Book sometimes has useful articles on deals, especially for bigger / more significant ones. Here’s a great example for Apollo’s buyout of Chuck E. Cheese. If you can’t find the key multiples (EV / Revenue, EV / EBITDA, etc.) in these sources, look up the company’s filings in the SEC database (for non-US companies, you’ll have to look at the investor relations section of their sites) and search for anything that was issued around the time of the deal announcement. If you can find the Fairness Opinion (for an M&A deal), that’s ideal because the bank discloses so many of the numbers and key multiples. If not, you can still calculate them yourself based on what’s in company presentations issued around the time of the deal announcement. For equity issuances, look at the S-1 (or equivalent form in other countries) and use the company’s share price at issuance – which is easy to find in online sources. It can be tougher to find information on debt issuances unless you have access to Bloomberg or Capital IQ, so it’s generally a better idea to cite LBO / M&A / equity deals in interviews. As you can tell, it takes time to do this research. I create new case studies every year, and it still takes me at least 1 hour to find everything required for even a basic discussion of an M&A or LBO deal. So I don’t recommend going crazy with this and researching dozens of deals – prepare to discuss 1 deal, or maybe 2 deals at most. How Do You Actually Discuss a Deal? Now you’ve done the research, found enough press releases, and you have the basic numbers required for the discussion. 1) Background information on the buyer and seller (revenue, profits/EBITDA, multiples, businesses) – or just the company itself in an equity/debt discussion. 2) Deal rationale – Why did the buyer/seller want to do it? Why did the company want to issue debt or equity? 3) Premium paid and deal multiples, and anything else unusual such as the deal structure (e.g., if it was an asset deal rather than a stock one). There’s no premium in an equity or debt deal, so there you’re just focused on multiples and, for debt deals, credit stats such as leverage and coverage ratios. 4) Your opinion on whether or not it will be beneficial for both the buyer and seller (or the issuing company) in the short-term and long-term. Most deal discussions miss point #4 completely, which is probably the most common mistake. Many discussions also miss the background information and deal rationale and skip straight into the numbers – that’s another mistake because the interviewer will have no idea what you’re talking about. As with all interview questions, you should be concise in your verbal answers to this question, but you can give more detailed explanations if you’re answering in writing. Here, we’ll go through 2 examples for the Twitter IPO and the Dell leveraged buyout. Yes, they’re both tech companies, but they’re also both based on real deal discussions I’ve critiqued in recent mock interviews. Plus, it gives me another chance to laugh at how over-hyped and insanely overvalued Twitter is. And since I’m not laughing at the Fed or central banks or “the recovery” this time around, Twitter will serve as a close substitute. “One deal that interested me recently was Twitter’s $1.8 billion IPO. Twitter, a major social media company everyone knows, had around $317 million in revenue and a net loss of $80 million in its last fiscal year prior to IPO, and in its current fiscal year so far, sales have increased nearly 80% but the net loss has also increased. Twitter decided to go public because of the favorable market environment and its growing size – the company could raise funding at an attractive valuation that let insiders and investors reap their gains while also giving the firm enough funds to continue growing its business. Twitter priced at $26.00 per share, which valued it at around 12.4x forward revenue. That was in-line with Facebook’s multiple of 11.6x and LinkedIn’s multiple of 12.2x at the time. Although those multiples are extremely high and unheard of for non-tech companies, the valuation wasn’t completely ridiculous since the comps were in a similar range. After the IPO, however, Twitter’s shares surged almost 73% in the first day and even went over $70.00 before falling back closer to $60.00 in the months afterward. In my opinion, the original valuation at $26.00 share was reasonable, though still very rich compared to other industries, and a good deal for both new and old investors. The valuation since the IPO, however, has grown far too high and it’s likely that the price will decline once again, especially if Twitter misses revenue, earnings, or user growth expectations. Commentary: The background information here is very brief because everyone knows Twitter, but we do at least mention the industry, revenue, and net income figures. The most important part is that we cite the multiples of peer companies and use those to show how the initial valuation was not that ridiculous – but how it became overvalued afterward as silly retail investors hopped on board the train, unknowingly headed into a large black hole. EV / EBITDA and P / E multiples do not apply since the company was unprofitable, so we cite revenue multiples instead (which is, itself, another sign of an overvalued company). You could get all this information from 2 mainstream news articles, with no further work required: Bloomberg and Business Insider. “One deal that interested me recently was Silver Lake’s $24 billion leveraged buyout of Dell, announced early last year. Dell was a struggling hardware and software company that started out selling PCs, but expanded into laptops, servers, software, and services. As of the deal announcement, it had around $57 billion in revenue and EBITDA of $4.2 billion. Prior to deal rumors leaking out, it traded at 3.9x EV / EBITDA and 0.3x EV / Revenue. The official deal rationale was that Dell could not turn itself around as a public company, and required the buyout to get out of the public eye while it transformed itself (to focus more on mobile, software, and services). At the same time, Silver Lake was looking for bigger targets to acquire since it had so much ‘dry powder’ back then. They paid a ~25% premium for Dell, which equated to 5.1x trailing EBITDA. Close to $13 billion in funding came from debt, $6 billion from excess cash, $4 billion from Michael Dell’s rollover, and just over $1 billion in equity from Silver Lake. The leverage ratio, just over 5x, was fairly aggressive for this type of company, but the excess cash funding and the fact that Michael Dell’s ownership increased from 15% to nearly 80% incensed shareholders, who were being excluded from the potential upside of the deal. My opinion is that it’s unlikely to be a great deal for anyone except Michael Dell – there’s no reason the company had to go private to transform its business because companies like IBM and HP did that as public entities. In the short-term, Dell’s share price probably wouldn’t have increased by a huge amount – so while people like Carl Icahn were correct that the offer could have been better, they wouldn’t have necessarily seen a ton of extra upside from a one-time cash dividend and holding Dell’s stock. Commentary: OK, I “cheated” a bit on this one by referencing all the work we’ve already done for the Dell LBO case study covered previously on this site. It would be very difficult to find all this information from press releases – but you can find a surprising amount, even if the estimates are very rough. For a good example, see this Seeking Alpha article. The numbers aren’t precise and you won’t necessarily get the point on the IRR from that, but it’s a move in the right direction. For better sources, you should review the actual filings for the deal and do the math yourself. The most important point is that we’ve expressed an opinion on the key issue: was it a good deal for everyone involved? And the answer, in my view, is “no” for the reasons stated above. Now you have the instructions you need to find information on deals, you have my recommended template, and you even have a few sample deal discussions to use as your references. Now, go research 1-2 recent deals that interested you and make sure you have enough information to follow the structure outlined above. A fantastic deal discussion won’t necessarily get you an offer – but a terrible discussion almost guarantees that you won’t get the offer. But it’s not a chance you’d want to take in the current (job) market environment. (1) Is there any way to find specific Software deals this bank has done? They don’t have much info on the bank’s website. (2) All else equal, would you suggest discussing a Software deal this bank worked on (bcoz that shows that I have done my research), or a Software deal they did NOT work on (bcoz then the banker would not know so much detail and cannot ask very detailed questions)? 1) Capital IQ is the best way to look up deals if you have access. If not, and you can’t find much online, you can’t do much to find deals here because some banks just don’t publish that information. 2) I would recommend picking a software deal this bank did not work on because you want to demonstrate your knowledge of the sector but avoid discussions where the interviewer knows far more than you. It seems you are somewhat critical of the deal in both cases above. Being mildly critical and thoughtful seems better than simply approving of the deal you discuss (shows that you can think). 1) Would it be fine to be critical or bring up any concerns even if the bank you’re interviewing with is involved in the deal? 2) Is it important to discuss the deal your interviewer’s bank is involved with (to show the interest in that bank)? 3) How recent should the deal be (last 12 month, last 2 yrs, etc.)? Thanks for the great article. Yes, I think it’s fine to bring up concerns or weaknesses even if the bank you’re interviewing with was involved with the deal. Just don’t make it too overtly negative. You don’t need to pick a deal the interviewer’s bank was involved in. Aim for high-quality discussions on deals you know well, not deals that match up with their bank exactly. Last 12 months is best. Can you share an example of an M&A deal response to this question? We have examples in the Interview Guide. We may update this article with a different example in the future. Thank you so much. I’ve been in the job market for over two years with no success. i believe this will help me a great deal. I’m a first year and not getting as much exposure on pitches as my other 1st year class although I’ve just closed my first deal. Do you think I should be speaking up or does this reflect my work product and it’s a sign I’m not performing well? So I am a second year analyst at a generalist investment bank, looking to lateral over to a larger, energy-focused IB group. I’ve have a good amount of deal experience that I can leverage during an interview. However, I am having a tough time approaching the question “So walk me through some of the deals you’ve worked on?” Do I just ramble off all the deals on my resume (I have 4 listed from my current job and another two at a previous shop), give a quick background story on each deal, and then tell them how I added value to the overall deal process(i.e. developed book, financial model, facilitated flow of information)? I feel like I might be talking for a while and potentially lose the interviewer’s interest. How would I approach this type of question where the interviewer wants me to walk him/her through multiple deals at once?? We cover this topic in other articles and in the interview guide… you can go on for a bit longer (maybe 60 seconds) for a discussion of a deal you’ve worked on, but you still shouldn’t speak for minutes at a time. For a summary question like that, summarize the industries and deal types and then ask them what they want to hear more detail on. Don’t go into details on individual deals until they ask you to. How recent does the deal have to be? Can I discuss the Qualcomm-NXP deal in an interview this month? Within the past year should be fine, so yes, especially since that one is still developing months after the announcement. How do we find the % of debt that a sponsor used in an acquisition? Is it revealed in any of the SEC filings of the target? You should be able to find it somewhere in the filings or press releases… or, better yet, Capital IQ if you have access. I am preparing for a private-equity interview right now and my resume states the company names and $ amounts for some of my previous deals as this information is public. I am not sure how to talk about the fundamentals of those deals without breaking any confidentiality rules. For instance can I mention the percentage revenue split of the company by industry or by customers or any kind of future growth projections? Is it bad practice to discuss deals that the bank itself hasn’t taken part of, even though the deal I’m discussing is really hot in the press (e.g. Twitter IPO or Comcast/Time Warner)? What I’m really wondering is if I should have 1 or 2 deals to discuss with each bank. I’ll be interviewing at the associate level if that helps/matters. Thanks! Yes you can do that, but its ideal if you can discuss deals the bank was involved in. Make sure you know the deals inside and out if you were to bring them up in interviews. How would you explain raising preliminary prospectus and additional funding in terms of private placements? And in terms of #’s I only have deal size, warrants, premium % over the conversion price. Any others I should mention? Those #s are fine. Private placements are very similar to the IPO discussion since you also discuss valuation, the company’s appeal to investors, and so on, the main difference being that there’s no post-IPO price performance to discuss. So I would focus on how investors reacted to the offering, whether it was oversubscribed, etc. in place of the post-IPO performance. Thanks Brian. Another question came to mind… How would you explain “potential IPOs or Private Placements” without revealing and maintaining the confidential info. I know this is off topic but are you going to do an article on fine art/paintings as an alternative investment? Especially because I’m a part-time painter. If someone volunteers, sure, we can cover that. It would have to be an interview, though, because I don’t know anything about it personally. 1 Do you agree with the notion that you should specifically not discuss a deal in the bankers particular industry ? Like if your interviewing with someone from TMT you shouldn’t discuss a recent tech deal since they are probably extremely knowledgeable on all aspects of the deal? 2. I’ve been having difficulty finding multiples and numbers for acquisitions of specific divisions as opposed to whole companies. For example in the recent IBM Lenovo deal. Where would you recommend finding that data as EBIT numbers don’t seem to be in the mainstream media or finance articles. Is it ever okay to not have specific multiples handy? 1. I agree somewhat, but this doesn’t matter as much as people say because chances are they did not work on the deal. And if it’s outside their sub-sector focus they probably won’t know much about it. If you don’t have at least one multiple to point to, don’t use the deal. There is great information on some databases such as Zephyr (which a lot of universities have access to). I used it for interviews since you can narrow down and filter deals by industry, size, region, and more importantly by the underwriters/advisers so that you talk about a deal the same bank you are interviewing at has completed. You can get a short description, multiples and often pro-forma financials. It’s not free, but if you have access its a great resource! Yeah that is a good point, though not everyone has access to those. PrivCo is another good source for private companies, but it’s expensive and less common than Capital IQ. Dealbook will often list the financial and legal advisers for bigger deals as well. Good topic to touch on and its not that difficult to get info on past deals of Banks you are going to interview for , its just that most of those sites where info is uploaded you have to bloody PAY for them. Even to read articles of newspapers like WSJ,FT,leveragedfinancenews etc you need to subscribe. True, but you can still get a lot of information for free from mainstream news articles.